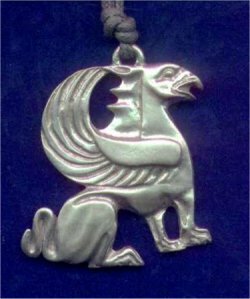 Pewter griffin pendant Actual Size: 1 5/8" x 2.25". The Gryphon is the symbol of Valor and death defying bravery. It is in the heraldic position Sejant or sitting position. Cast from LEAD FREE PEWTER. It has been hand polished to a warm satin finish. The pendant is hung on a 36" long, 2.5mm black cotton cord.